Diabetes Type 1, one of the two widely spread forms, is an autoimmune decease, which is caused by destruction of insulin-producing beta cells in pancreas. This type of Diabetes is called insulin-dependent: the body’s immune system attacks the beta cells located in the Islets of Langerhans in the pancreas, which normally maintain the blood sugar levels by producing the necessary amount of insulin. When the islets do not release the insulin, the amount of glucose in the blood builds up. This results in cells suffering and dying from the lack of glucose and high blood sugar levels, which makes multiple organs collapse and lead to coma and death. Understanding the relationship between structure and function in biology requires continuous developments in the field of microscopy. While electron microscopes and fluorescence microscopes have been go-to techniques for studying organic samples at a high resolution, individually they fall short in offering the exhaustive data needed for truly in-depth life science research. In 2011, the Charged Particle Optics group at TU Delft completed the development of the SECOM. 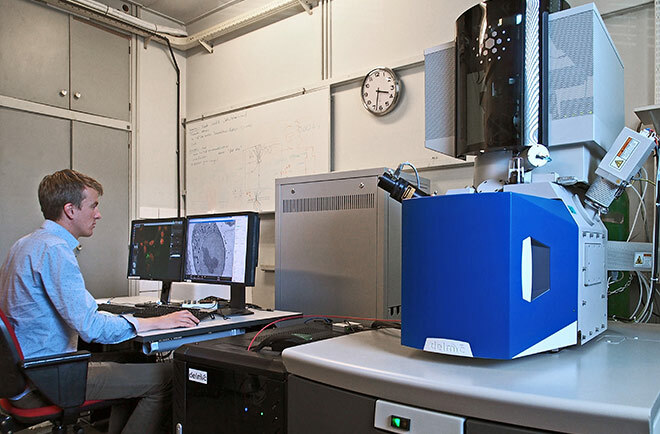 This system integrates a light and electron microscope, thus combining the labelling capabilities of fluorescence microscopy with the high-resolution nanoscale data obtained from electron microscopy. Six years later, the department of Imaging Physics houses no less than five SECOM systems. In order to make new discoveries in the life sciences, innovations need to be continuously made in microscopy. This way, scientists can take an ever-closer look at phenomena that are happening on a molecular scale. Fluorescence microscopy is considered a reliable tool for studying organic samples at a high resolution. Nevertheless, the diffraction barrier of light poses the problem of not being able to distinguish objects that are smaller than the wavelength of light. Proteins, for example, can be as small as four nanometers. Even recent developments in light microscopy - such as super-resolution which can resolve objects at a smaller scale - come with the problem of providing no contextual or structural information besides the objects that glow under fluorescence. Scientists of all fields are most certainly familiar with the miniature worlds unearthed by electron microscopy. From the complex structures of viruses to extremely small forensic evidence, the revelations brought about by this technology have led to enormous developments in the scientific world. The wavelength of fast electrons is significantly smaller than that of visible light, creating images that were previously unobtainable with conventional light microscopy. 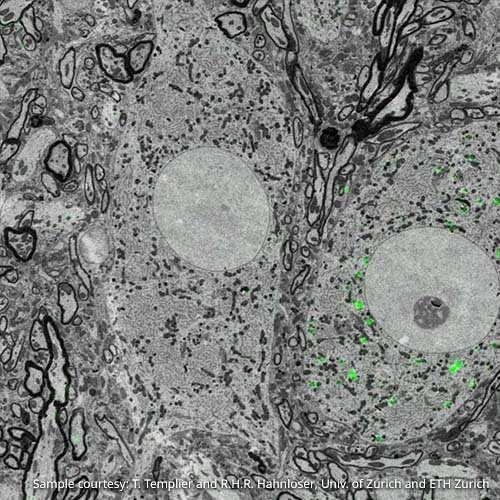 For life scientists in particular, the main advantage of electron microscopy (from here on referred to as EM) is the contrast that the black-and-white high-resolution images reveal, providing essential information on the structure of a cell, organelle, or organic tissue. Choosing for the right correlative light and electron microscope can be a challenge. It is a sizable investment in terms of time and funding. Furthermore, as knowledge grows in scientific disciplines and as publishing becomes ever more competitive, increasingly complex technology is needed to ensure the accuracy and the integrity of research. In a labyrinth of options, we offer the technology and the ongoing personal service needed for today's ambitious researchers in the life sciences: the SECOM system, and a team of committed engineers to help you throughout the process of your research. As a researcher in the life sciences, your work will very likely involve studying various parts of a cell at small length scales. In particular, you may be interested in examining biomolecules and their function within the greater context of the cell as a whole. 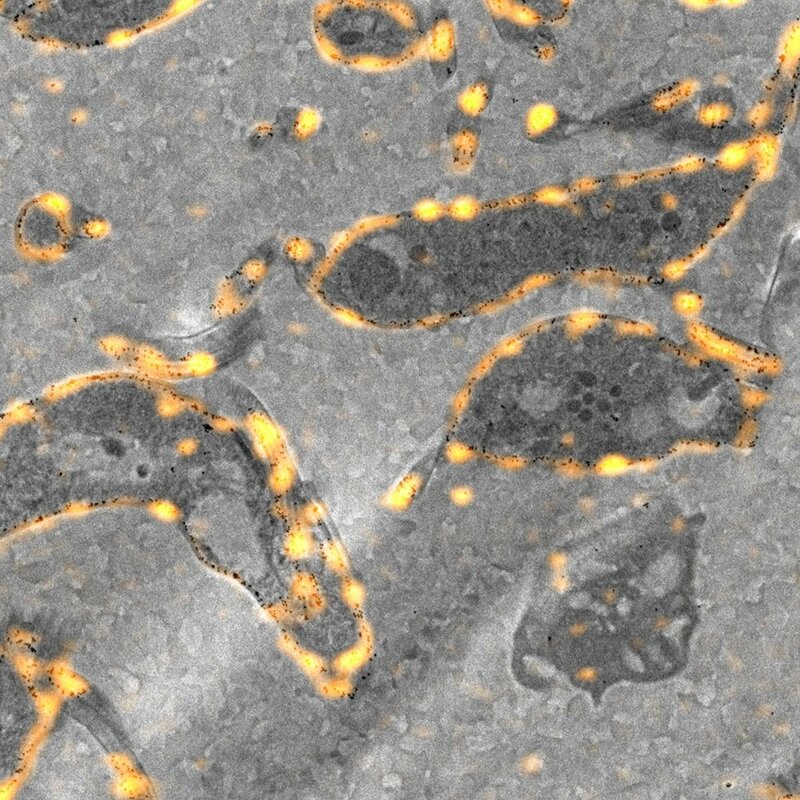 Recent technological and methodological developments in microscopy have made this process much more straightforward, with integrated fluorescence and electron microscopy. 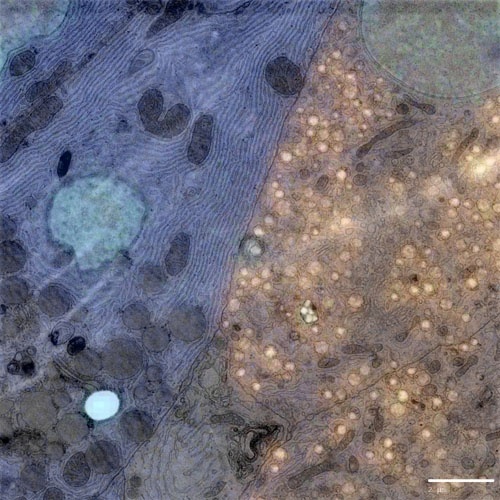 Such a system allows for automatically overlayed images from both an electron and a light microscope, providing you with the ability to identify certain organelles or biomolecules by tagging, at the same time that you are able to localize where they are situated within the cell. 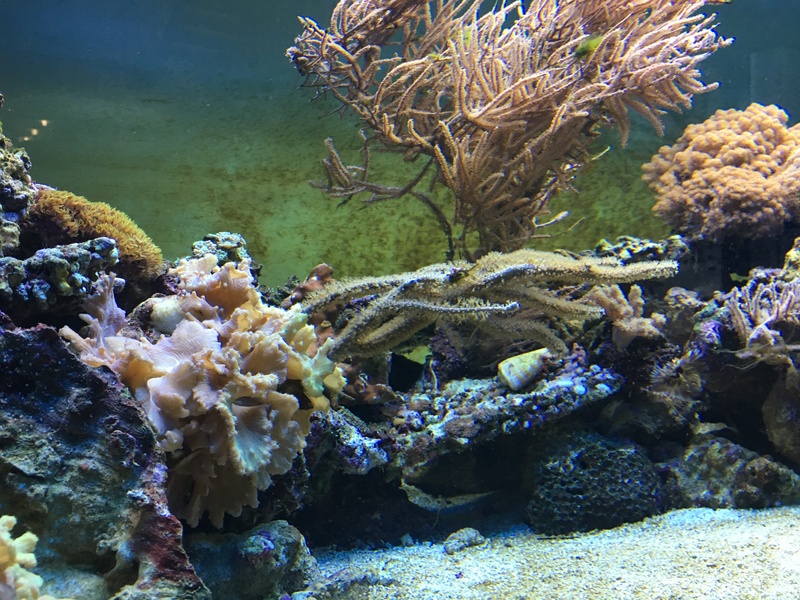 More recently, super-resolution fluorescence imaging has been developed, which opens up even greater opportunities for learning about the complexities of life.